This article is about the city of Versailles. For the Château de Versailles, see Palace of Versailles. 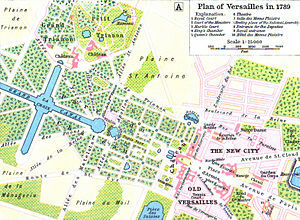 For other uses, see Versailles (disambiguation). Versailles (French pronunciation: [vɛʁˈsɑj] or [vɛʁˈsaj]) is a city in the Yvelines département in Île-de-France region, world-widely renowned for its château, the Château de Versailles and the gardens of Versailles, designated UNESCO World Heritage Sites. According to the 2008 census, the population of the city is 88,641 inhabitants, down from a peak of 94,145 in 1975. Located in the western suburbs of the French capital, 17.1 km (10.6 mi) from the centre of Paris, Versailles is in the 21st century a wealthy suburb of Paris with a service based economy and a major touristic destination as well. Besides, the Congress of France - the name given to the body created when both houses of the French Parliament, the National Assembly and the Senate, meet - gathers in the Château de Versailles to vote on revisions to the Constitution. The etymology of Versailles is clear that the argument tends to privilege the Latin word versare, meaning "to keep turning, turn over and over", expression used in medieval times for plowed lands, cleared lands (lands that had been repeatedly "turned over"). This word formation is similar to Latin seminare ("to sow") which gave French semailles ("sowings", "sown seeds"). During the Revolution of 1789, city officials had proposed to the Convention to rename Versailles Berceau-de-la-Liberté ("Cradle of Liberty"), but they had to retract their proposal when confronted with the objections of the majority of the population. From May 1682, when Louis XIV moved the court and government permanently to Versailles, until his death in September 1715, Versailles was the unofficial capital of the kingdom of France. For the next seven years, during the Régence of Philippe d'Orléans, the royal court of the young King Louis XV was the first in Paris, while the Regent governed from his Parisian residence, the Palais-Royal. Versailles was again the unofficial capital of France from June 1722, when Louis XV returned to Versailles, until October 1789, when a Parisian mob forced Louis XVI and the royal family to move to Paris. Versailles again became the unofficial capital of France from March 1871, when Adolphe Thiers' government took refuge in Versailles, fleeing the insurrection of the Paris Commune, until November 1879, when the newly-elected government and parliament returned to Paris. During the various periods when government affairs were conducted from Versailles, Paris remained the official capital of France. Versailles was made the préfecture of the Seine-et-Oise département at its inception in March 1790 (at which time Seine-et-Oise had approximately 420,000 inhabitants). By the 1960s, with the growth of the Paris suburbs, the Seine-et-Oise had reached more than 2 million inhabitants, and was deemed too large and ungovernable, and thus it was split into three départements in January 1968. Versailles was made the préfecture of the Yvelines département, the largest chunk of the former Seine-et-Oise. At the 2006 census the Yvelines had 1,395,804 inhabitants. Versailles is the seat of a Roman Catholic diocese (bishopric) which was created in 1790. The diocese of Versailles is subordinate to the archdiocese of Paris. In 1975, Versailles was made the seat of a Court of Appeal whose jurisdiction covers the western suburbs of Paris. 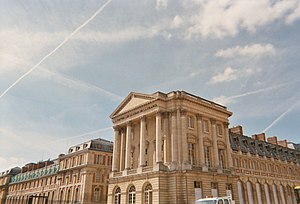 Since 1972, Versailles has been the seat of one of France's 30 nationwide académies (districts) of the Ministry of National Education. The académie de Versailles, the largest of France's thirty académies by its number of pupils and students, is in charge of supervising all the elementary schools and high schools of the western suburbs of Paris. Versailles is also an important node for the French army, a tradition going back to the monarchy with, for instance, the military camp of Satory and other institutions. Versailles is located 17.1 km (10.6 mi) west-southwest from the centre of Paris. The city sits on an elevated plateau, 130 to 140 metres (425 to 460 ft) above sea-level (whereas the elevation of the centre of Paris is only 33 m (108 ft) above sea level), surrounded by wooded hills: in the north the forests of Marly and Fausses-Reposes, and in the south the forests of Satory and Meudon. The city (commune) of Versailles has an area of 26.18 km² (10.11 sq mi, or 6,469 acres), which is a quarter of the area of the city of Paris. In 1999, Versailles had a population density of 3,344/km² (8,660/sq mi), whereas Paris had a density of 20,696/km² (53,602/sq mi). Born out of the will of a king, the city has a rational and symmetrical grid of streets. 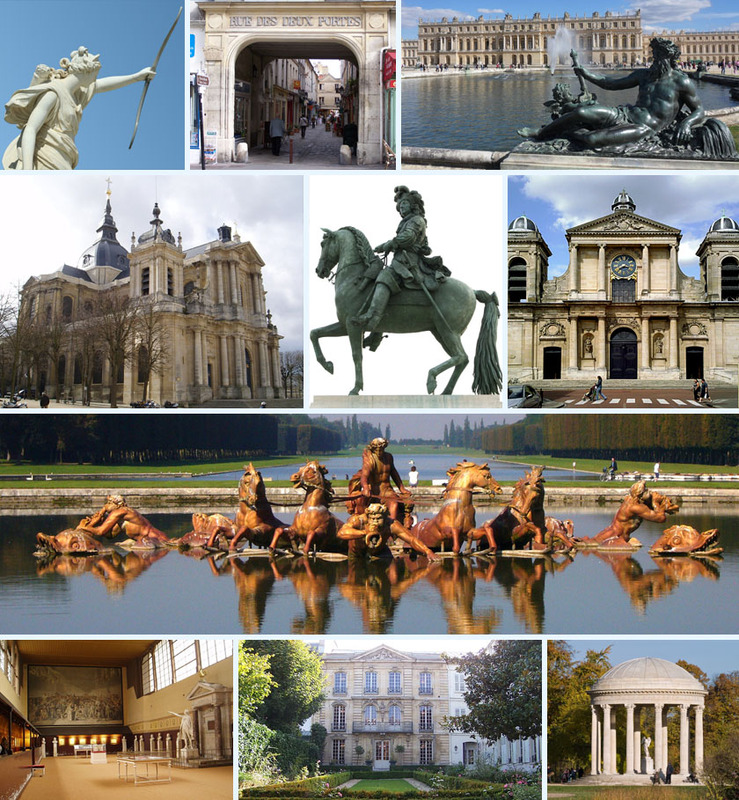 By the standards of the 18th century, Versailles was a very modern European city. Versailles was used as a model for the building of Washington, D.C. by Pierre Charles L'Enfant. The name of Versailles appears for the first time in a medieval document dated 1038. In the feudal system of medieval France, the lords of Versailles came directly under the king of France, with no intermediary overlords between them and the king; yet they were not very important lords. In the end of the 11th century, the village curled around a medieval castle and the Saint Julien church. Its farming activity and its location on the road from Paris to Dreux and Normandy brought prosperity to the village, culminating in the end of the 13th century, the so-called "century of Saint Louis", famous for the prosperity of northern France and the building of Gothic cathedrals. The 14th century brought the Black Plague and the Hundred Years' War, and with it death and destruction. At the end of the Hundred Years' War in the 15th century, the village started to recover, with a population of only 100 inhabitants. In 1561, Martial de Loménie, secretary of state for finances under King Charles IX, became lord of Versailles. He obtained permission to establish four annual fairs and a weekly market on Thursdays. The population of Versailles was 500 inhabitants. Martial de Loménie was murdered during the St. Bartholomew's Day massacre (24 August 1572). In 1575, Albert de Gondi, a man from Florence who had come to France with Catherine de' Medici, bought the seigneury of Versailles. Henceforth Versailles was the possession of the Gondi family, a family of wealthy and influential parliamentarians at the Parlement of Paris. Several times during the 1610s, the Gondi invited King Louis XIII to hunt in the large forests around Versailles. In 1622, the king purchased a parcel of forest for his private hunting. In 1624, he acquired more and entrusted Philibert Le Roy with the construction of a small hunting lodge of red bricks and stone with a slate roof. In 1632, the king bought the totality of the land and seigneury of Versailles from Jean-François de Gondi. The hunting lodge was enlarged to the size of a small château between 1632 and 1634. At the death of Louis XIII, in 1643, the village had 1,000 inhabitants. This small château was the site of one of the historical events that took place during the reign of Louis XIII, on 10 November 1630, when, on the Day of the Dupes, the party of the queen mother was defeated and Richelieu was confirmed as Prime minister. 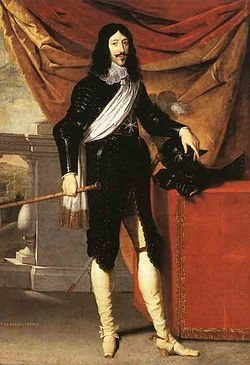 King Louis XIV, son of Louis XIII, was only five years old when his father died. It was 20 years later, in 1661, when Louis XIV commenced his personal reign, that the young king showed interest in Versailles. The idea of leaving Paris, where, as a child, he had experienced first-hand the insurrection of the Fronde, had never left him. Louis XIV commissioned his architect Le Vau and his landscape architect Le Nôtre to transform the castle of his father, as well as the park, in order to accommodate the court. In 1678, after the Treaty of Nijmegen, the king decided that the court and the government would be established permanently in Versailles, which happened on 6 May 1682. At the same time, a new city was emerging from the ground, resulting from an ingenious decree of the king dated 22 May 1671, whereby the king authorized anyone to acquire a lot in the new city for free. There were only two conditions to acquire a lot: 1- a token tax of 5 shillings (5 sols) per arpent of land should be paid every year ($0.03 per 1,000 sq ft (93 m2) per year in 2005 US dollars); 2- a house should be built on the lot according to the plans and models established by the Surintendant des Bâtiments du Roi (architect in chief of the royal demesne). The plans provided for a city built symmetrically with respect to the Avenue de Paris (which starts from the entrance of the castle). The roofs of the buildings and houses of the new city were not to exceed the level of the Marble Courtyard, at the entrance of the castle (built above a hill dominating the city), so that the perspective from the windows of the castle would not be obstructed. The old village and the Saint Julien church were demolished to make room for buildings housing the administrative services managing the daily life in the castle. On both sides of the Avenue de Paris were built the Notre-Dame neighborhood and the Saint-Louis neighborhood, with new large churches, markets, aristocratic mansions, all built in very homogeneous style according to the models established by the Surintendant des Bâtiments du Roi. Versailles was a vast construction site for many years. Little by little came to Versailles all those who needed or desired to live close to the maximum power. At the death of the Sun King in 1715, the village of Versailles had turned into a city of approximately 30,000 inhabitants. When the court of King Louis XV returned to Versailles in 1722, the city had 24,000 inhabitants. With the reign of Louis XV, Versailles grew even further. Versailles was the capital of the most powerful kingdom in Europe, and the whole of Europe admired its new architecture and design trends. Soon enough, the strict building rules decided under Louis XIV were not respected anymore, real estate speculation flourished, and the lots that had been given for free under Louis XIV were now on the market for hefty prices. By 1744, the population reached 37,000 inhabitants. The cityscape changed considerably under kings Louis XV and Louis XVI. Buildings were now taller. King Louis XV built a Ministry of War, a Ministry of Foreign Affairs (where the Treaty of Paris (1783) ending the American Revolutionary War was signed in 1783 with the United Kingdom), and a Ministry of the Navy. By 1789, the population had reached 60,000 inhabitants, and Versailles was now the seventh or eighth-largest city of France, and one of the largest cities of Europe. Seat of the political power, Versailles naturally became the cradle of the French Revolution. The Estates-General met in Versailles on 5 May 1789. The members of the Third Estate took the Tennis Court Oath on 20 June 1789, and the National Constituent Assembly abolished feudalism on 4 August 1789. Eventually, on 5 and 6 October 1789, a crowd of women joined by some members of the national guard from Paris invaded the castle to protest bread prices and forced the royal family to move to Paris. The National Constituent Assembly followed the king to Paris soon afterwards, and Versailles lost its role of capital city. From then on, Versailles lost a good deal of its inhabitants. From 60,000, the population had declined to 26,974 inhabitants by 1806. The castle, stripped of its furniture and ornaments during the Revolution, was left abandoned, with only Napoleon briefly staying one night there and then leaving the castle for good. Louis-Philippe, who took the throne in the July Revolution of 1830, saved the castle from total ruin by transforming it into a National Museum dedicated to "all the glories of France" in 1837. Versailles had become a sleepy town, a place of pilgrimage for those nostalgic for the old monarchy. The Franco-Prussian War of 1870 put Versailles in the limelight again. On 18 January 1871, the victorious Germans proclaimed the king of Prussia, Wilhelm I, emperor of Germany in the very Hall of Mirrors of the castle, in an attempt to take revenge for the conquests of Louis XIV two centuries earlier. Then in March of the same year, following the insurrection of the Paris Commune the French government under Thiers relocated to Versailles, from where the insurrection was militarily quelled. The government and the French parliament stayed in Versailles after the quelling of the insurrection, and it was even thought for some time that the capital of France would be moved definitely to Versailles in order to avoid the revolutionary mood of Paris in the future. Restoration of the monarchy was almost realized in 1873 with parliament offering the crown to Henri, comte de Chambord, but his refusal to accept the tricolor flag that had been adopted during the Revolution made the restoration of monarchy impossible for the time being. Versailles was again the political center of France, full of buzz and rumors, with its population briefly peaking at 61,686 in 1872, matching the record level of population reached on the eve of the French Revolution 83 years earlier. Eventually, however, left-wing republicans won a string of parliamentary elections, defeating the parties supporting a restoration of the monarchy, and the new majority decided to relocate the government to Paris in November 1879. Versailles then experienced a new population setback (48,324 inhabitants at the 1881 census). After that, Versailles was never again the seat of the capital of France, but the presence of the French Parliament there in the 1870s left a vast hall built in one aisle of the palace which is still used by the French Parliament when it meets in Congress to amend the French Constitution, as well as when the French president addresses the two chambers of the French Parliament. The Château de Versailles (Pavillon Dufour) in the spring of 2006. It was not until 1911 that Versailles definitely recovered its level of population of 1789, with 60,458 inhabitants at the 1911 census. In 1919, at the end of the First World War, Versailles was put in the limelight again as the various treaties ending the war were signed in the castle proper and in the Grand Trianon. After 1919, as the suburbs of Paris were ever expanding, Versailles was absorbed by the urban area of Paris and the city experienced a strong demographic and economic growth, turning it into a large suburban city of the metropolitan area of Paris. The role of Versailles as an administrative and judicial center has been reinforced in the 1960s and 1970s, and somehow Versailles has become the main center of the western suburbs of Paris. The center of the town has kept its very bourgeois atmosphere, while more middle-class neighborhoods have developed around the train stations and in the outskirts of the city. Versailles is a chic suburb of Paris well linked with the center of Paris by several train lines. However, the city is extremely compartmented, divided by large avenues inherited from the monarchy which create the impression of several small cities ignoring each other. Versailles was never an industrial city, even though there are a few chemical and food processing plants. Essentially, Versailles is a place of services, such as public administration, tourism, business congresses, and festivals. From 1951 until France's withdrawal from NATO unified command in 1966, nearby Rocquencourt was the site for SHAPE. Versailles is also an important military center, with several units and training schools headquartered at the Satory military base, which was the headquarters of the famed 2nd French Armored Division until 1999, and where a military exhibition is organized annually. Versailles' primary cultural attraction is the Palace, with its ornately decorated rooms and historic significance. The town also has other points of cultural notability; in recent times, its position as an affluent suburb of Paris has meant that it forms a part of the Paris artistic scene, and musical groups such as Phoenix, Air and Daft Punk have some link to the city, as does the director Michel Gondry. Versailles is served by Versailles – Chantiers station, which is an interchange station on Paris RER line C, on the Transilien La Défense suburban rail line, on the Transilien Paris – Montparnasse suburban rail line, and on several national rail lines, including low-frequency TGV service. Versailles is also served by two other stations on Paris RER line C: Versailles – Rive Gauche (the closest station to the Palace of Versailles and consequently the station most frequently used by tourists) and Porchefontaine. Versailles is also served by two stations on the Transilien Paris – Saint-Lazare suburban rail line: Versailles-Rive-Droite and Montreuil. ^ a b (French) SPLAF. "Ancien département : Seine-et-Oise". http://splaf.free.fr/78o.html. Retrieved 7 July 2009. ^ (French) INSEE. "Populations légales 2006 pour les départements et les collectivités d'outre-mer". http://www.insee.fr/fr/ppp/bases-de-donnees/recensement/populations-legales/france-departements.asp. Retrieved 7 July 2009. ^ (French) La Grande Encyclopédie (1902). "Volume 31 (on page 882)". http://gallica.bnf.fr/document?O=N024666. Retrieved 20 June 2007. ^ a b c d (French) Cassini Project. "Versailles – Notice communale". http://cassini.ehess.fr/cassini/fr/html/fiche.php?select_resultat=39569. Retrieved 20 June 2007. This page uses content from the English language Wikipedia. The original content was at Versailles (city). The list of authors can be seen in the page history. As with this Familypedia wiki, the content of Wikipedia is available under the Creative Commons License.